Apple Music comes to your browser. Improvements to Apple Music could be showcased at WWDC later today — but one new feature has slipped out early. 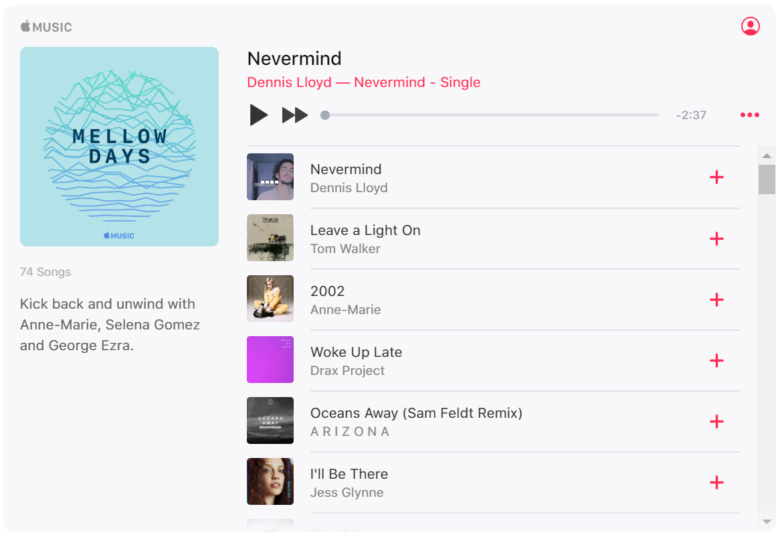 A new web player gives Apple Music fans the ability to sample and enjoy full tracks in their browsers. Apple previously allowed Music users to share tracks, but the web player was incredibly basic and only allowed 45-second previews. To enjoy the full song, users had to open the Music app on their iOS device or iTunes on their Mac or PC. Apple Music’s new web player looks significantly better. The new web player allows Apple Music subscribers to sign into their account and enjoy full tracks outside of iTunes or the Music app. Users can enjoy entire albums and playlists, and access playback controls for pausing, skipping, adding songs to their library, and more. The web player doesn’t have everything, though. You still can’t search the entire Apple Music library or create new playlists. However, it will let you access existing playlists and albums if you have a link. Try it out below. The new Apple Music web player makes Cupertino’s streaming-music service more accessible, which could boost subscription numbers. Users can finally enjoy their favorite tracks and albums in a browser on devices that don’t have access to iTunes or the Music app. The player should prove particularly useful in work settings where users cannot install unapproved apps on their machines. We should find out more about Apple’s plans for Apple Music during its WWDC keynote later today. It seems Apple is aware that the Music player has been discovered early and is now preventing some users from signing in, AppleInsider reports. However, I was able to sign in successfully shortly before publishing this story.